In 1998, the idea was mooted that a sponsored walk in the mountains might prove to be a good fundraiser. St Francis Hospice, Raheny was selected as the beneficiary, and the first walk took place to Lugnaquilla, the highest mountain in Ireland outside Co. Kerry. Fast forward to 2018 and our 20th anniversary. The organisers decided to do something a little bit special to mark the occasion and so it was decided to travel to the Giant's Causeway, Co. Antrim. On the day 27 walkers travelled. We stopped for a short break at the Carrickdale Hotel in the morning and reached our destination just before noon. 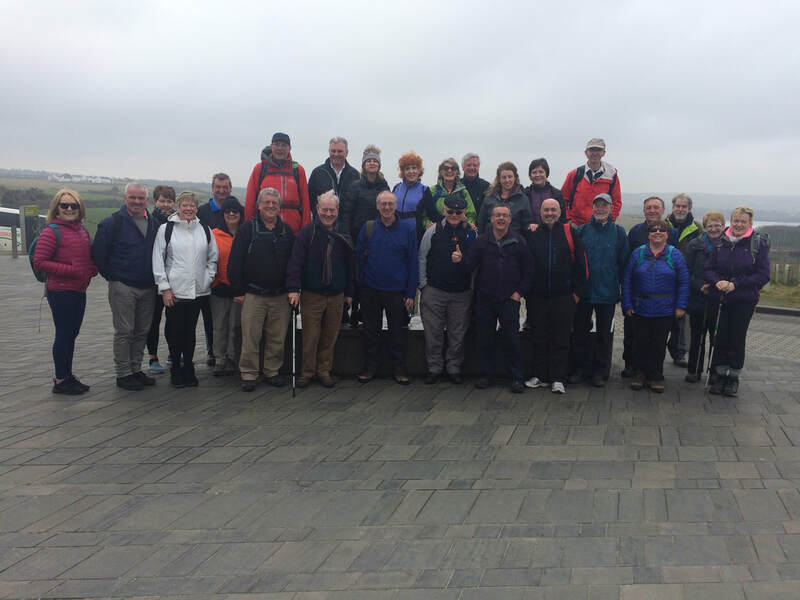 The walk itself was not too challenging, but, as it was the first visit to the site for many of the walkers, considerable time was taken on the causeway itself taking photos. Then it was on to the Organ, and back to the bus via the Shepherds' Path. On the way home we stopped again at the Carrickdale for sandwiches and "refreshments"
Our thanks to the walkers, to Malahide Coaches, to the Carrickdale for their help and to Fiona and Mark of KBC Bank for their sponsorship. A slideshow of images from the day. Photos from Sheilagh, Cormac, Brian, Mary S, Michelle and Stephen. Presentation to St. Francis Hospice June 2018. L to R Sheilagh McGirl, Michael Ryan, Mary Mc Namara (President) Sr. Margaret Cashman, Stephen MacDonagh, Bernadette Gillis.